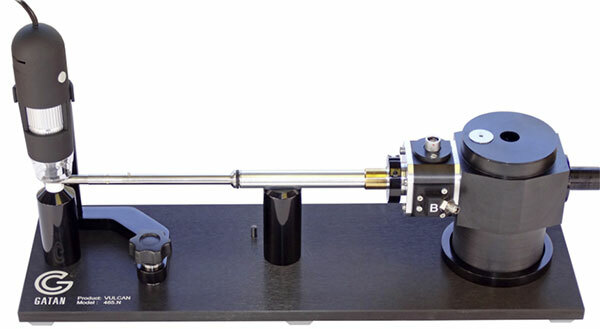 Characterise the luminescence properties of materials at the nanoscale with the Gatan Vulcan cathodoluminescence detector. Collect, detect and analyse cathodoluminescence (light) with your TEM. The Vulcan cathodoluminescence system can be used with most standard imaging and analysis techniques, including EELS (Electron Energy Loss Spectroscopy). 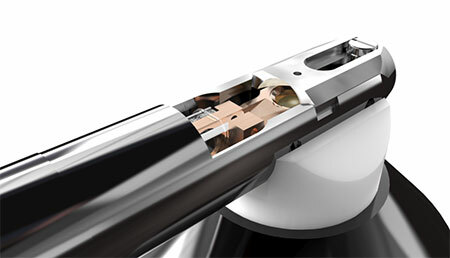 When not in use, the hardware can be completely removed from the microscope. The system is compatible with other Gatan hardware, so you can perform multi-signal spectrum imaging with complementary CL and EELS and/or EDS. Use with Gatan Microscopy Suite software. 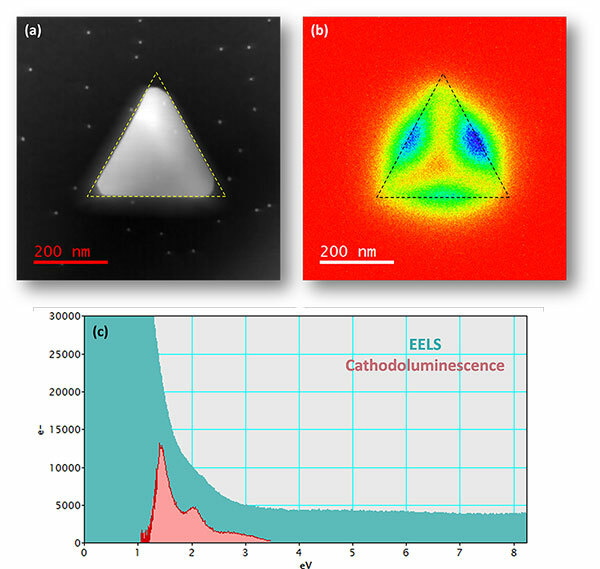 Cathodoluminescence and EELS analysis of a gold prism (250 nm side length). (a) STEM dark field image; (b) Cathodoluminescence total light intensity map. The prism is indicated by a black dotted line; (c) Comparison of CL and EELS spectra in TEM/STEM with FEG electron source. The tail of the EELS zero loss peak (FWHM 0.65 eV) is convoluted with the surface plasmon resonance mode obscuring information. CL is an emission spectroscopy and is not affected by energy spread from the primary electron beam.